World Timber Corporation is a family owned and operated direct importer of exotic lumber. Supplying a large selection of quality species from all over the world. Species include but not limited to, Bocote, Cocobolo, Gabon Ebony, Macassar Ebony, East Indian Rosewood, and Ziricote. We also supply domestic lumber such as Cherry, Birds Eye Maple, and Holly and we cater to both small and large exotic wood buyers. Our company has and will mix species and quantities on an order. We are a supplier who understands how to meet your needs while still maintaining wholesale pricing. Not having to purchase an entire bundle of one species allows our customers the ease of purchasing the lumber and the amount they really need. If your order calls for pen blanks, turning squares, bowl blanks, lumber, and or live edge slabs we are the place for you. Please see our complete list of exotic woods or see what new and unique items we have to offer. The story of world timber corp.
World Timber Corporation was founded by Joseph Steinbach in 1984. His career in the lumber business started in 1967 working for a large Lumber co. in New Jersey, starting out his first day learning how to grade and measure 300,000 feet of Teak (which took over 3 months) working the dry kilns, band saw, veneer saws and working orders. He started to travel in 1970 for Teak, Philippine Mahogany, and East Indian Rosewood. Joe then became Manager of Jersey Facility in 1977. In 1978 he left the Jersey Facility for a chance to operate a new Facility to expand their import and export sales of exotic woods. By 1984, Joe figured he had the experience and contacts through out the world to start his own foreign and domestic lumber company. Starting out in Easton, PA, Joe and a good friend Edward Mast started selling, purchasing, and traveling, the two of them doing everything that needed to be done. Business was prosperous and a warehouse was leased to store kiln dried lumber. After years of toil and tenacity Edward Mast unexpectedly passed away in 1994. In 1995 and 1996 were a few years of new employees and new ideas. We have a great selection of unique wood species including live edge slabs, figured material and unusually wide boards. 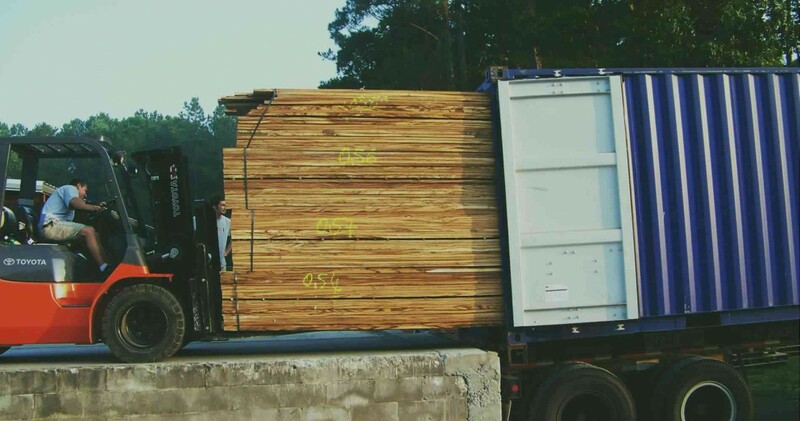 The majority of the lumber arriving at our facility is 4/4 and 8/4. We do carry other thicknesses and turning squares in certain species. You can see the availability of each species in our exotic lumber section. If you don't see what you are looking for or have some questions on what we have or will have please contact us. This section is dedicated to newly arrived species of lumber, turning stock and unique stock items. When a new container arrives at our dock we will post pictures and information on its contents. We will inform you of the species and the sizes available.